Story Title: Book Three: Why Ask Why? The stage is set for things to come as the new Azrael battles Nightwing. This issue, we get the battle between Nightwing and this new Azrael. We also get some further look into the “politics” and “origins” of the sect of the Order behind this new Azrael. Following the battle, we have a bunch of jammed-together scenes that don’t feel all that organic, but put stuff into place for the coming-soon ongoing Azrael series. The art remains stylistic–not horrible, but not particularly thrilling. It definitely sets this book off from the other Bat-books, and sets a certain tone that I can’t quite put to words. Story-wise, I’m not impressed. If this were in itself the third issue of an already-ongoing series, I might feel differently about it. As-is, I feel slightly hoodwinked, jumping on for a 3-issue mini that I thought would tie closely to Battle for the Cowl. What I got is something that is loosely tied to that story and an ending that doesn’t affect that story and simply tells me to follow more of this story in a new Azrael book. This does definitely establish that there is a new Azrael and he’s not being abandoned after this brief story; if you’re interested in the concept, this isn’t a bad series…just look at this as a “pilot” and the rest of the series will pick up soon. If you’ve not already picked up the first couple issues, this is not worth getting, and at this point, you may as well wait for a collected volume. After so looking forward to this book…and generally being a fan of Nicieza‘s work, this issue leaves me quite disappointed. Especially for the fact that I had to practically re-read the thing to try to tell what exactly is going on–whatever larger plot, I’m apparently not picking up on it all that much. The new Azrael’s costume is an old suit of armor, apparently cursed…and very much in demand, whether or not the man in the suit likes it…and the story seems to move around that and how the person wearing the suit is affected. This issue’s art in and of itself is not bad–it’s nothing spectacular, but at the same time it is far from dissatisfying. No specific complaints on this aspect of the book. Story-wise, I can’t help but wonder if I’m having trouble following things because of not being steeped in Azrael’s story. 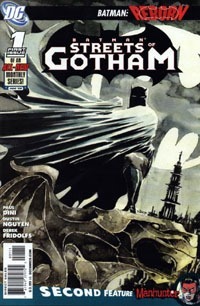 I know the original character from the Knightfall stuff, and read a couple other issues here or there–the Gotham Earthquake, stuff during No Man’s Land, as well as the final issue. Other than playing with some small toys placed in the larger Batman sandbox, this feels quite irrelevant to the Battle for the Cowl, and at a mere 3 issues–of which I’ve now read 2–I don’t know how the ending’s going to be at all satisfying…this almost needs to be 4 or more issues. I dislike blatantly decompressed stories–those stretched several issues beyond what they need to be. This issue seems almost the opposite–I feel like we’re at best just starting to get an idea of what’s going on, and already the next issue is supposed to be the ending of the story. I don’t particularly recommend this issue in itself. If you can snag it with the first issue and the third issue when that comes out, I imagine it might make for a decent one-sitting read. And perhaps the next/final issue will shed more light on things and make character more distinctive and memorable. As-is, though, this issue–even with its cliffhanger–doesn’t even excite me enough to have me looking forward to that next issue. Unless you’re coming to the Battle for the Cowl with a completist mentality, I think it’s safe to say you could avoid this book without really missing out on anything. A new Azrael is chosen and sent forth as Gotham struggles for lack of a Batman. It’s been awhile, but this is one book I was interested in for the character, regardless of writer or artist. It actually reminded me of my earliest days in following comics, back before I really noticed specific writers or artists and simply read and enjoyed comics for the specific characters. We open on a new Azrael beheading a criminal (in a scene that I couldn’t help but think to myself “In the end, there can be only one…”). We then move behind the scenes to a faction of the Order of St. Dumas that is apparently not the same as that which set Jean-Paul Valley into things back in Sword of Azrael and beyond. These folks realize they need another Azrael, and so recruit someone who fits their present “requirements” for the role. We see this character into action as the new Azrael, and into a somewhat counter-intuitive cliffhanger. I’m not terribly impressed with the art…it’s not to say it’s bad or anything, but there’s something to the style that just comes off kinda strange to me, and Nightwing in particular looked rather “off” in proportion/shape as depicted in here. Otherwise, the style definitely sets this book apart giving it its own look/feel, which does contribute a bit to the story as it helps show that this is definitely not an Azrael we’ve already seen. The story itself also isn’t all that impressive to me, especially as something that’s only gonna run for three issues. I don’t see how there’ll be room to really see enough to get to know the character(s) in this book prior to the conclusion of the third issue, and that takes me outta things a bit. (At the same time, if this were an ongoing book or had several more issues, I think I’d be pretty much satisfied as far as first issues go). Nicieza builds on elements introduced in Morrison‘s run on Batman, which is cool–showing that this fits in existing continuity and isn’t being showhorned in. Since we’re only one issue in here and have only one issue of Battle for the Cowl out so far, I’m not sure exactly where this series is going to fit–how tightly this will play into the main story. At the same time, there’s plenty of potential as we get introduced to this character who could be just the latest to hang onto the role before passing it along. If you’re a fan of the Azrael concept and don’t mind reading a character that is NOT Jean-Paul Valley, or you’re just following the entirety of the Battle for the Cowl “event,” this’ll certainly be worth your while.